Uncompromising style just like the big guys, they'll love the Skytop sneakers from Supra® Kids! Hi-top silhouette. Uppers made of leather, suede, or abrasion-resistant canvas. Lace up closure for snug fit. Logo at tongue and heel. Perforations at toe. Padded tongue and collar for a comfortable fit. Elastic tongue straps and thin padding with ankle support. Padded mesh lining for breathable all-day wear. Vulcanized, gum rubber outsole for a slimmed down look and added durability. Imported. Measurements: Weight: 8.5 oz Shaft: 4 in Product measurements were taken using size 2 Little Kid, width M. Please note that measurements may vary by size. Logo at tongue and heel. Perforations at toe. Padded tongue and collar for a comfortable fit. Elastic tongue straps and thin padding with ankle support. Padded mesh lining for breathable all-day wear. Vulcanized, gum rubber outsole for a slimmed down look and added durability. Imported. Measurements: Weight: 8.5 oz Shaft: 4 in Product measurements were taken using size 2 Little Kid, width M. Please note that measurements may vary by size. 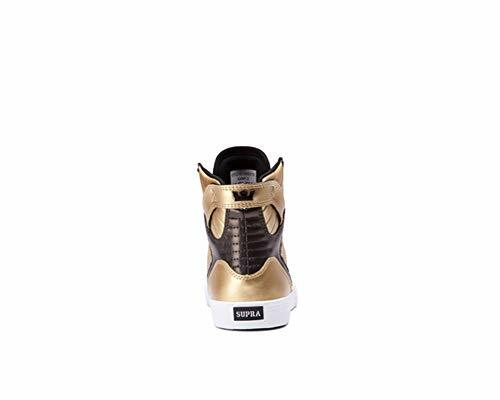 If you have any questions about this product by Supra Kids, contact us by completing and submitting the form below. If you are looking for a specif part number, please include it with your message.